Mud season is here. It has come early this year. Rain has dominated the day today. The sounds on our metal roof are soothing, are like they were on our old roof. It had been drizzling for hours. Sophie stood at the edge of the 12 foot high deck, at attention, back feet on the deck and front feet on a small pile of wood gazing at something I could not see. After a while I joined as I had finished my painting for the day. We gazed out into the world together. The rain came harder and we were both getting cold and wet. I thought to come in but was unwilling to break the gazing into the world from our new place on this earth. 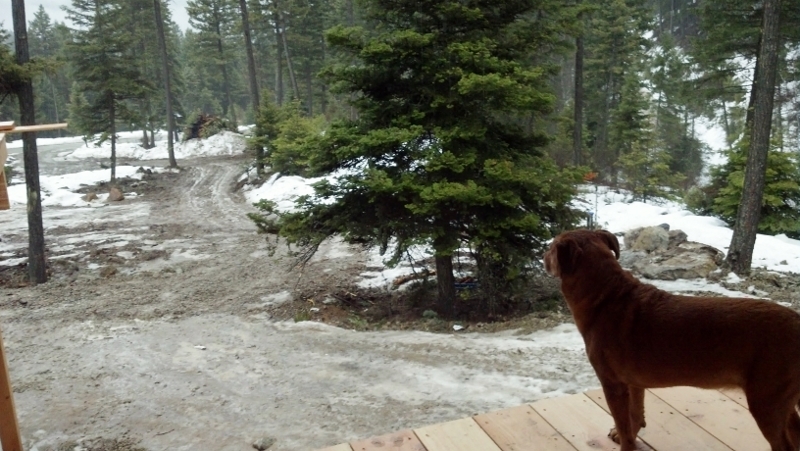 I did not want to leave gazing at the mud in the driveway and the yard with the snow still piled under the trees. I did not want to stop gazing at the ridge beyond us as clouds roiled out of the valley just behind like water out of a tea kettle. It was cold and growing colder and wetter. I remembered we had a porch. We walked inside the short distance between the deck and the porch and went outside again. It was still cold, the snow less melted on this side of the house.But it was dry. It was as we dreamed it would be. I sat on the edge of the porch with my legs dangling waiting for my spouse to come back home with the Friday Pizza. He had been on errand duty including getting 30 gallons of paint and primer and then on to get a take-and-bake pizza since we have an oven again. I waited outside as long as I could but finally the cold overtook us and we went inside. I thought of the times we had stayed outside in this sort of weather, my spouse and I, when we were camping or ski patrolling. I thought of living in a tent in this kind of weather when I was a child. I thought of a few days of homelessness I experienced in my life and how it was in this kind of weather. I remembered a time when I was on a 6 month backpacking trip and found myself chilled to the bone. In the fog ahead was a small diner. I had joined with another hiker for a few weeks. When we arrived at the diner we knocked on the back door and asked what we could have for 15 cents, which even then was not much money but it was all we could find between us. The lady who came to the door said she would look. A but later she motioned us onto a small porch where vegetables were prepared and flour stored. She gave us a nearly new bag of white bread in a yellow plastic bag. To each of us gave a kitchen bowl of chicken broth with a few carrots swimming in it. She muttered that she had too much broth so we could have it. Cold rain and mud mean something. When we meet in 1974 we both yearned for something we did not have. We yearned for mountains and we yearned for space and we yearned for love. We were young and the yearning was quitet, not fully articulated to others or even to us. Each of us yearned alone. When we meet the yearning met. We each had seen the 1972 movie Jeremiah Johnson. We each had been enchanted and had felt drawn to it for a feeling of home. It is hard to put your finger on how it could be home. The land was mostly open and the settlements rough and the farms sometimes dangerous due to fighting between the indigenous Indians and the settler whites. The time frame for the story is ambiguous. My spouse used it every semester when he taught Western History. His challenge to his students was to identify the time period the story covered. The historical comments in the movie place it both before and after the Civil War. Jeremiah goes to the Rockies to live away from people. He has seen too much. The implication is that war has eaten away at him and drives him into the mountains. While not war, the injustice and the exhaustion of the Civil Rights movement followed by the riots across the county in the early to mid 1970s brought me to the full question as to whether there would be another Civil War. I did not want to participate in the hatred and violence that was all around me. In the movie the quote above is said with wonder and wistfulness. In reality it is unusual for a mountain man not to have lived and worked with a group of mountain men. However, this mythical story of the lone man struggling to survive in the wilderness is a cultural hero journey that must be told. It is unclear how long it is that they have seen each other, probably months. Bear Claw was Jeremiah’s mentor, saving him from certain death in the challenging environment of the high country of the Rocky Mountains. They share food and soon after they depart. The scene progresses as if they had seen each other the day before and would see other the next day. It picks up from the last sentence and leaves open the next sentence. Time is amorphous. It is not clear when in time the story takes place and the characters interweave themselves with each other in a way that time is not relevant. The quote above has a gentle cadence to it that reflects the gentleness of time. Throughout the story relationships are so strong that time is irrelevant. When we meet we both yearned for the mountains and I think both of yearned for the kind of permanence that the story of Jeremiah Johnson has. The permanence is related to place but it is not hindered by time. Since the wildfire took our home, we have counted the months and struggled knowing that we were still drifting without a home and without a place in the world. We did intermittently have that sense of permanence. I think it was there because of the relationship. Moving from one place to another and having lost everything we had is an assault on one’s sense of self. In our case our sense of self was held in place by the sense of the other. When we both misplaced our sense of self things exceedingly difficult. I think the word misplaced is important. It is about not knowing the place where something is. Mis-placed describes the condition of not-placeness. Having no place in the world cuts one adrift. It creates the condition of anomie, of not being related to the other and thus not knowing how one should act. When we were in school, about the time we meet, we both studied Emile Durkheim’ concept of anomie. Durkheim set out the term to describe a condition of dis-regulation occurring in society. When society is disregulated people don’t know what to expect from each other and become isolated or at the extreme used the absence of norms as a justification for pushing lawlessness. In many ways the wildfire that burned away our daily lives made us anomic. We did not know what to expect from the world we found ourselves living in from day to day and even moment to moment. When that anomie fell between us the times were very grim. The isolation was devastating. Our time in anomie with each other was fleeting but we were lucky. Divorce rates typically rise after a natural disaster. One could hypothesis that the stress of not knowing were one’s place is, of being mis-placed, would be a major stressor. Being mis-placed is as simple as waking up in the morning and not knowing what room you are in or as disruptive as not remembering were to go when you get in your car to leave the grocery store. We discussed yesterday how we no longer feel mis-placed living in our little basement apartment underneath the house that will be our place in the coming weeks. When I wake up in the morning in our room here in our apartment is sufficiently similar that I have merged, like Jeremiah Johison, my sense of time. In those first few waking moments, there is no gap between that now dead house and this place. They are not the same but they feel the same. They both feel normal. They do not feel anomic. When I go upstairs, even though it changes every day Monday through Thursday when the work crew is here, I know what to expect. I expect my house that has a form and shape that is of us. It does not produce a state of anomie. These past timeless months, adrift without knowledge of what to expect, has shaped us but we have also shaped it. We have known what to expect from each other and in that we have not been truly mis-placed.